The Easy and Elegant Lifestyle advocates taking advantage of what’s around you. Live well, well within your means. The one inch thick center cut porkchops were deeply discounted for immediate sale at the grocery. I had a bottle of hard cider languishing at the back of the refrigerator and thought they might like to meet. They got along famously. The Easy and Elegant Life’s Cider Sauced Porkchops for Two. 2, 1-inch thick, center cut porkchops, on the bone. Approx. 1 Tablespoon of minced thyme (fresh) or 1/2 Tbs. dried. Vegetable oil for browning the chops. Rinse and pat dry the chops. Season with salt and pepper. Heat a skillet (my flame was medium high heat.) Toss in the seeds and toast for about 2 minutes. They’ll be fragrant. Crush them up in a bowl and add the remaining ingredients for the glaze. Reheat the skillet with the oil over medium high heat until it’s smoking hot. Add in the chops and brown well for 5 minutes or so (they will spatter a bit, be careful. A splash screen is useful here.) Flip and brown the other side for about 2 minutes. Transfer to a platter and tent with tin foil. Pour off the oil from the skillet. Drop the chops back in with the more browned side up. Add in the sauce ingredients. Cook until they are just done. Mine took about 10 minutes (I let them get up to about 150º – 160º internal temperature and they were still juicy, but not violently pink.) Kill the heat and remove to the platter and tent again. Let them rest for a few minutes while you sauté the green beans (or microwave them for about a minute) with butter. Pour any pan juices from the platter into your sauce and stir constantly over medium heat for about 3-4 minutes (or longer.) Just don’t burn the sauce; you want it to sort of caramelize. Return the chops to the pan, turn to coat. Plate with the well browned side up and pour some of the sauce over, garnish with a bit of green parsley. You could drink cider with these, but a Viognier or Vouvray would really fit the bill. As would a green salad lightly dressed with walnut oil. 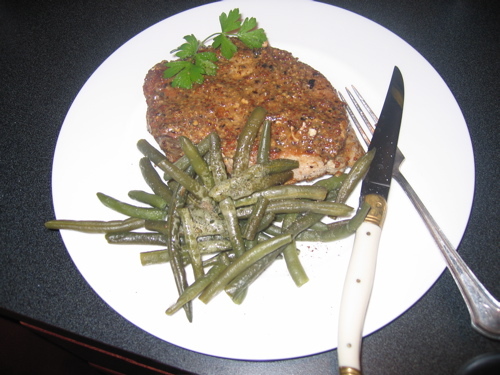 This entry was posted in Entertaining and tagged hard cider, pork chops, recipes. Bookmark the permalink. You are killing me with this!!! First thing in the morning??? I will be craving this recipe all day now. Great job! I am going to try this ASAP. What next? Morning photos of Krispy Kremes????? Fold outs of Beignets? Speaking of beignets… they used to be a staple on weekends at my parents’. Food for thought. uh………..and the darling cooks as well. Ah, yes, Southern green beans. I lived through many servings of those. AL, what’s bred in the bone… I should have quickly sauced them and made Greek style green beans, but wasn’t sure of the juxtaposition of the flavours. I alway cook with wine (sometimes I will even put it in the food).